Terry Fox: A Unifying Influence on Canada? April 14, 2015 April 14, 2015 2 Comments on Terry Fox: A Unifying Influence on Canada? 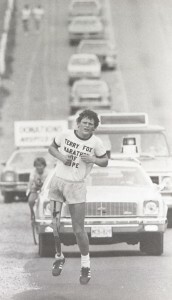 This post is the second in a series of four marking the 35th anniversary of Terry Fox’s Marathon of Hope. Nationalism was a key part of the public conversation when Fox began his cross-Canada run on April 12, 1980. Six weeks later Quebecers would vote in a referendum on sovereignty-association. Even though 60 percent of voters in the province voted against transforming their relationship to Canada, the issue of Quebec separation loomed large in the minds of English Canadians. Commentators of the time described 1980 as a bleak year. For example, Globe and Mail editorialist John Fraser described Canada as a nation with fractures “as wide as they have every been.” And, in his in his 1981 Lament for a Nation-style polemical Canada Lost, Canada Found, journalist Peter Desbarats characterized this period as one with a “never-ending panorama of missed opportunities…and vast potentialities that never seem to be realized.” Terry Fox ran directly into this national malaise, a good news story at a time when Canada seemed to be in crisis. Beyond these explicit references to unity, letter-writers and commentators frequently used the term “all Canadians” and “everyone” when describing the impact of Fox. Reading these characterizations of Fox as a unifying public figure made me wonder what French-language sources had to say about the runner. Since there were no French language letters in the archives, I looked at coverage in La Presse and Le Devoir to for evidence that readers linked Fox to the unity question. They did not. Coverage of the Marathon of Hope in the French language press was minimal. Fox himself was disappointed and frustrated with his experience in the province. Bitterly, Fox wrote in his diary that “very little” fundraising would be “done in Quebec. Apparently they can’t speak English. Maybe they also don’t get cancer.” He also complained to the press that Quebec drivers would alternately try to run him off the road and stop to offer a ride, so little was local awareness of the run. Fox meets Trudeau in Ottawa, 1980. CP. Reports on whether or not Fox had any specific feelings on national unity vary. He told newspaper reporters at his investiture to the Order of Canada that he didn’t know about politics “but he would like to see a stronger, better Canada.” Observing a conversation between Fox and a group of Franco-Ontarians about Quebec, Toronto Star reporter Leslie Scrivener remarked that the runner asked about the referendum. While the Francophones’ response wasn’t recorded, Scrivener reported that Fox “insisted that Quebec was part of Canada despite its language and cultural differences.” This refusal to engage on political questions was typical of Fox. He also refused to wear logos or align with other causes that would draw attention away from his cancer activism. When Fox set out in April 1980 he did so at a moment when Quebec was seriously considering seceding from confederation, a possibility that upset many English Canadians. Some Canadians saw Terry Fox as a balm that could heal an ailing Canada. The runner seemed, as Leslie Scrivener put it, to be “brimming with determination and hope” at a time when Canada was on the cusp of separation. But French-speaking Quebecers and English Canadians interpreted the story of Terry Fox differently. Fox was seen as hero, as newspaper coverage in Quebec shows, but there is no evidence that his story was connected to the unity issue. Looking at Terry Fox from the perspective of national unity illuminates the dynamics of nationalism in the early 1980s. Where unity was the focus in English Canada, this concern didn’t animate the Quebec discussion that focused on cultural and political autonomy. The fact that Fox got tied into this debate, however, helps us to see his story in new ways. Fox was a hero in his own lifetime and part of this may be because he captured the English Canadian imagination at a time when many needed hope.